The last two days have given us some idea of our future responsibilities. On Friday (not a school day in respect to Muslims) we helped entertain two groups of 20 or more who came to meet Abuna (that's Elias Chacour, the founder of the schools) and for tours of the schools. At the moment there are four volunteers here - Kate Proud, who will be here one more week, Franziska, a German student, and the two of us. All four of us were busy with the two groups. The first were about twenty from The Netherlands who arrived at 9:30 for a talk with Abuna in a small high school auditorium. We greeted them, and then provided refreshments and handled the table of books and videos available after the talk (Abuna stayed to sign books and carry on conversations). Kate took them on a tour, while Franceska went back to the guest house to help Badiya (the cook) set up tables and help prepare luncheon. We stayed with Abuna for the second talk, to 24 Mennonites, mostly from the US West Coast. He handled the two groups differently, addressing the Dutch while being less formal and more conversational with the Mennonites. In both cases he made the final point that he hoped for their support for the schools and for peace in the land in the future. Paraphrasing, he said " If you want to emphasize the bad behavior of Israeli Jews and the sad plight of the Palestinians, that's ok, but that is not the support I wish. I want support in my efforts to make this an inclusive country in which all people live peacefully together." We again handled the book sales and refreshments, cleaned up the area, put away the unsold books and took the papers and proceeds back to the guesthouse. 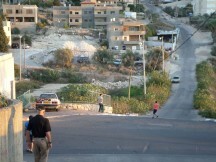 Kate helped us sort out the money, and we took it to Abuna so that he could carry it back to his office in Haifa. He is the Bishop of the Melkite or Greek Catholic Church in Israel. 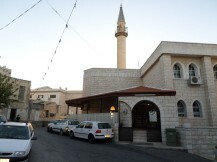 It is the largest Christian denomination in Israel with 80,000 members, and he holds the top position. He said in his talks that he would much rather be back at the schools, into which he has poured most of his life. When we brought the money to him we had an opportunity to talk briefly with him; we hope that there will be more opportunities in the future. We returned to the guest house to help clean up the lunch tables and dishes. The Dutch visitors seemed to find the dining room very comfortable and pleasant, and stayed on talking well past their promised departure time. I think we weren't finished until after three. 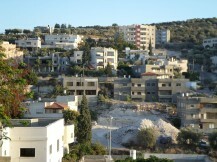 In the time that remained Ruth and I took a short walk into the neighborhood of the village near the schools. We did not go far - perhaps a quarter of a mile (half down and then the other half up.) We did find a small shopping area with mostly clothing and grocery stores, and perhaps the music school we are seeking. One person we encountered spoke good English. She is a medical student home for a day from her studies in Haifa. Otherwise it was all friendly faces and Arabic. This morning (Saturday) we had a short visit with the Middle School Principal, Victor. We also encountered a young man advertising his campaign for school council. Here he is on the left with his campaign manager. 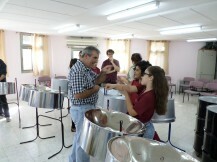 I have not mentioned three Americans here to introduce steel drums to the country and to attempt to form inter-cultural bands, using as an example the cross-cultural work of Daniel Barenboim in creating an Arab-Israeli youth orchestra. 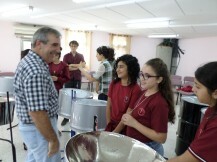 The foundation which supports them has sent twenty new steel drums to Ibillin, and for the past week Harvey Price, a percussionist from Philadelphia, has been forming a band with twelve MEEI middle school students. Today we went to their last practice and a short performance for parents and faculty who could attend. The event was remarkable inseveral ways. Harvey is clearly a great teacher and motivator and the children are quick learners. We have a short video of the performance (but I don't know how to add it as a HTML feature. You will just have to be happy with a few stills. I really don't have space to tell of every aspect of their project, but you can learn a lot from their website and facebook page. 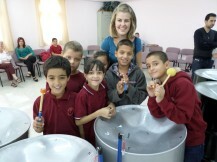 The three steel drummers are off to the Dead Sea this afternoon, and will be up early for their return flight today. In the meantime, four hiking pilgrims from Italy are making a stop here this evening. 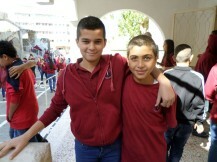 They have come from Acre, and tomorrow will hike on 15 miles to Nazareth. The cook has the night off, so Ruth and Kate are in charge. More about that later.